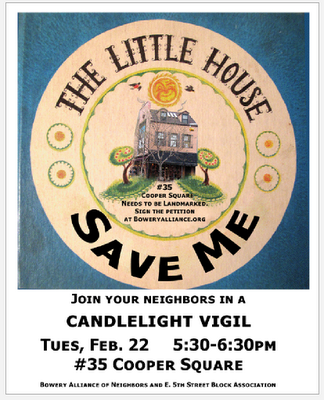 In my nabe there is a huge protest underway to save a little house at 35 Cooper Square. As you may know, the Bowery/Cooper area is being eaten alive by giant Eurotrashy hotels, schmancy eateries and ungapatchke condos. At best, we’re being deluged with people who like the IDEA of the Bowery (hobos! 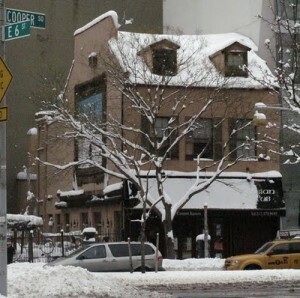 CBGB!) but have no interest in helping to preserve its history; at worst we get the entitled, oblivious, trend-crazed bottle-service crowd. And then there is the voracious, property-gobbling NYU. Don’t get me started. None of which is relevant to the city’s Landmarks Commission,which declined to designated the property a historic landmark, despite the begging of neighbors, historians, advocacy groups and elected officials like City Council member Deborah Glick. Writer Pete Hamill attended the vigil last night. Protesters held up signs modeled after Virginia Lee Burton’s timeless children’s book The Little House, 1943’s Caldecott-winner. “Once upon a time there was a Little House way out in the country,” the book begins. “She was a pretty Little House and she was strong and well built.” Her builder declares she can never be sold “for gold or silver,” but eventually the city encroaches, the trucks and steamrollers come, the skyscrapers take over. The Little House winds up isolated in the big city, where the lights have become so bright she can no longer see the moon. She winds up abandoned, surrounded by subways and sprawl. But one day the builder’s great-great-granddaughter learns of the house’s history and arranges to have her moved, whole, to a hill in the countryside, where once again the Little House will be appreciated and loved. The ending won’t be as happy for 35 Cooper. Demolition is likely to restart soon — a stop-work order placed a few days ago has been lifted. If I were a betting woman — I’m too sad to play the odds right now — I’d put big money on the wee Federal house being replaced by a giant dorm or condo; the current owner, Arun Bhatia/AIB Development, has built plenty of both. 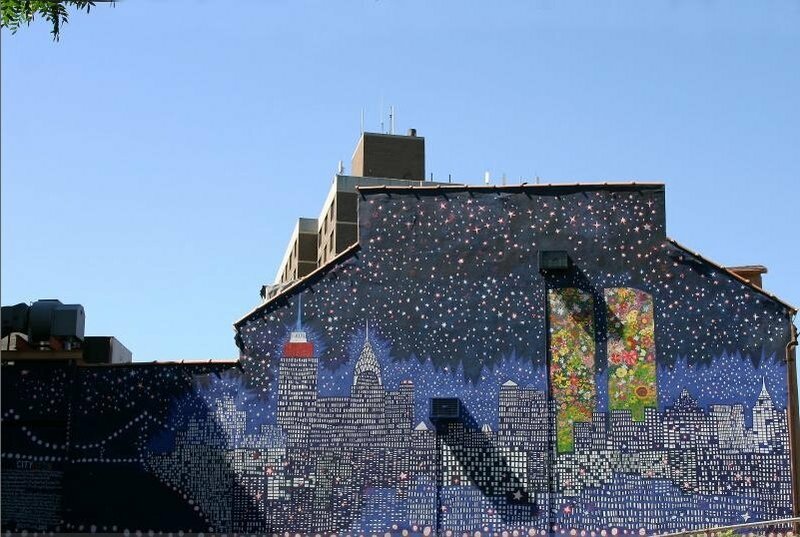 Once upon a time, 35 Cooper featured my favorite 9-11 mural. It went up shortly after the towers fell. It was right around the time of Josie’s birth, October 13, when all I did was trudge around the neighborhood in a sleep-deprived haze. The first time I saw it, I started bawling. And a dorm or condo will not have any of the history — any of the meaning — of the Little House. I’d recommend a sit in. You have millions of people who live in NY, and even a tiny fraction of them really care about this place, you can organize them to sit on the property and inside the house for as long as needed to draw attention to its plight. Trespassing is only a misdemeanor. Cultural heritage sites need to be protected. The Village is so important in Manhattan! I really liked this post, but it made me sad. I love Jeremiah’s Vanishing New York. I love NYC and while Avenue A is probably a more pleasant place for NYU students to live these days, I could bore you with reasons why it was better back when and wax nostaligic about watching double-features in the old Theatre 80 on St. Mark’s Place and the hours of misspent youth shopping for clothes in the snarliest stores I could find. Not in the Gap. 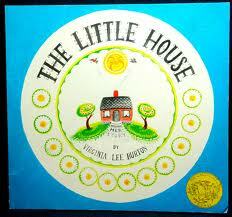 I grew up thinking the Little House was in the West Village and loved that book as a child and then as a reading-aloud parent. But as it turns out, the city, instead of it city growing out to overrun the country, is now undergoing a reverse-process of the suburbs sprawling in to overwhelm the city.